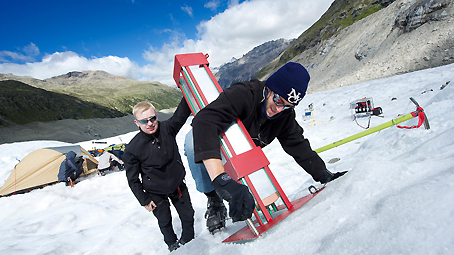 Scientists at FH Aachen tested the IceMole on the Morteratsch glacier in Switzerland, where it melted the ice successfully. The IceMole is put into operation and, slowly makes its way to the lake underneath the Morteratsch glacier as it melts through various layers of ice. The IceMole in its element: the probe melts its way through the ice of the Morteratsch glacier with no problems. 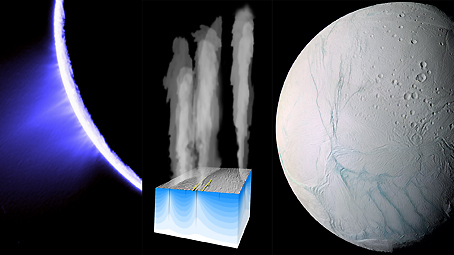 Cryovolcanism at the south pole of Enceladus: a plume, possibly emanating from a near body of liquid water, emanates from a series of jets located within the 'tiger stripes'. Enceladus Explorer will find out whether there are traces of life deep in the ocean of liquid water below the icy crust. Is there life under the icy crust of Enceladus? The Cassini spacecraft has confirmed the existence of active ice-spewing fissures on the surface of Enceladus. 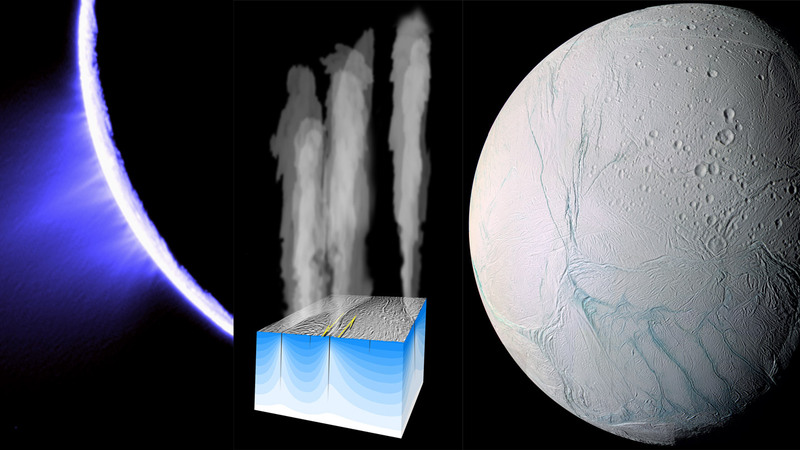 Giant jets of water ice are shot into space by these 'cryovolcanoes'. Flying through these icy fountains, Cassini detected organic compounds that could hint to the possibility of life. If Europe's plans for a future mission to Enceladus do become reality, German researchers would like to study this water source for traces of life. In support of that endeavour, the German Aerospace Center (Deutsches Zentrum für Luft- und Raumfahrt; DLR) is sponsoring a collaborative project entitled 'EnEx – Enceladus Explorer', which was launched on 22 February 2012. But the researchers are immediately faced with several problems. Firstly, landing directly on a cryovolcano is too risky. Secondly, these possible traces of life could already have been destroyed during their forceful ejection from the fissure and subsequent exposure to the hostile conditions of outer space. For this reason, the researchers are interested in obtaining samples from the depths of Enceladus. Cryovolcanic activity on Saturn's moon is – according to current theory – powered by liquid water located in gigantic reservoirs deep below the icy surface; it is even possible that a giant ocean of liquid salt water exists. This water rises to the surface through crevasses and fissures in the ice where it evaporates explosively and freezes instantly. The resulting ice fountains can shoot up to altitudes of several hundred kilometres before the ice particles slowly fall back to the moon's surface. The microorganisms that could have evolved in the hypothetical ocean of liquid salt water under Enceladus' icy crust, and have been swept away by the water spouting through the crevasses in the ice, would be extremely unlikely to survive; they would explode at the surface, and all that would remain are the organic compounds whose existence was verified by the Cassini spacecraft. The researchers on this collaborative project wish to analyse the rising water jets by taking samples while the water is still in a liquid state for this reason. To accomplish this, German engineers have already devised the initial concept for a technical solution; from a base station on the surface of Enceladus, an ice drill probe would be inserted into the ice crust to a depth of 100 to 200 metres, melting its way through the ice to a water-bearing crevasse. At this point, the probe will be able to obtain a sample of the liquid water and examine it in situ for the presence of microorganisms. The Enceladus Explorer, comprising a base station for power generation and the IceMole ice drill probe, would land at a safe distance from an active crevasse or fissure. The IceMole would be powered by a cable run from the base station. This cable would also provide the communication link between the two units. 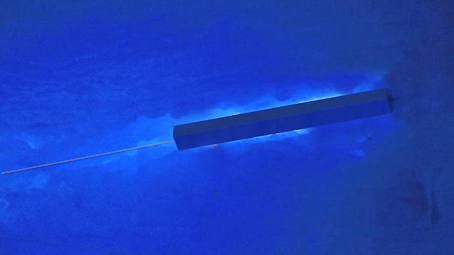 The IceMole would melt and drill its way down through the ice to a depth of about 100 metres before encountering a crevasse containing liquid water whereupon, in contrast to previous thermal deep-drilling probes, it would be possible to drive the IceMole in any direction. But just how does that probe find its way through the ice to that crevasse? This calls for a most ingenious navigation system. This is a difficult undertaking. Enceladus does not possess a global navigation satellite system, nor does it have any of the other external reference points like those here on Earth, such as a clearly defined and stable magnetic field or the stars. But this probe must be capable of, on its way down to the water, establishing its location and position, the distance to its objective, and calculating an optimum route. It will also be required to include factors into the equation such as operating range and power consumption, the transmission of data to the ground station as well as to take evasive action to avoid obstacles in the ice such as cavities and embedded rocky meteorites. EnEx is currently working on this complex navigation solution in a collaborative project with scientists from the German Armed Forces University in Munich, the Technical University in Braunschweig, FH Aachen, RWTH Aachen, BU Wuppertal and the University of Bremen. The IceMole is being constructed and its navigation payload is being installed under the management of the Aerospace Technology department at FH Aachen. Further to this, a scenario for subsequent deployment on Enceladus is being developed at the German Armed Forces University in Munich. But before the IceMole is allowed to start drilling its way into the ice on Saturn’s moon, it will be subjected to stringent trials under realistic conditions here on Earth. The IceMole has already melted its way successfully through the ice of the Morteratsch glacier in the Swiss canton of Graubünden. In the Antarctic, in cooperation with an international research team, it is now going to navigate down to a fissure in the ice as autonomously as possible. 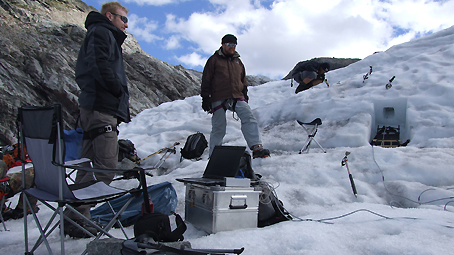 Once there, and this will be a first in the history of science, it will be able to obtain a water sample in entirely uncontaminated conditions from a lake located far below the glacier.